This entry was posted in Birds, Birdwatching, Christian and tagged Bible, Black Crowned Crane, Christianity, Creation, Crown of Righteousness, Devotional, Inspiration, Lord's Return, Nature, Photography. Bookmark the permalink. 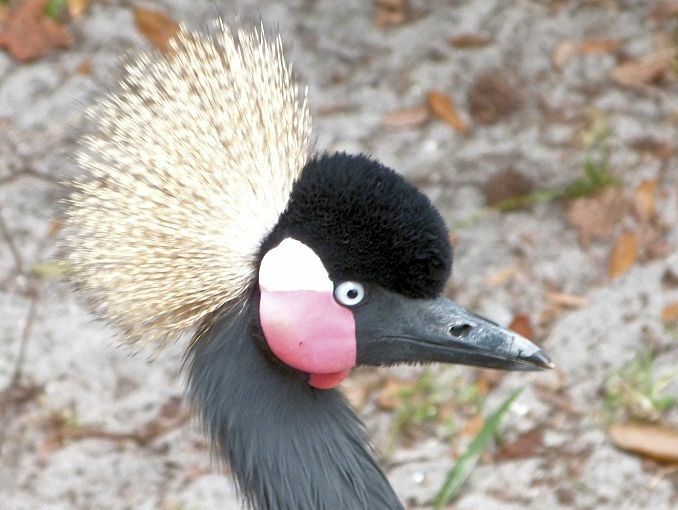 Looks like a close cousin to the Crested Crane (a/k/a East African Crowned Crane) mentioned in https://leesbird.com/2015/08/25/flag-that-bird-part-5/ — which appears on the official coat-of-arms of Uganda. The Crested and Crowned Cranes are similar, but this one is a subspecies (Balearica pavonina pavonina) that is in the western part of the Sahara. The Black Crowned Crane (Balearica pavonina ceciliae) is located in East Africa. Black Crowned Cranes have the white on top of red and the Grey Crowned Crane (a/k/a) Crested has the red at the top and white at the bottom of their face. And what a glorious crown it is!